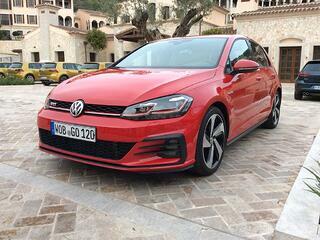 The MK7.5 Golf, a good choice? If somebody says to their friends, family, work colleagues or people in the pub that they have bought a new car and no matter whether the car is 15 years old, 10 years, six months or brand new, they ask what sort, what make and they answer a ‘Golf' - most will say, good choice, you can't beat a Golf and that sums up the Golf, a good choice, a great all-rounder. We flew into Palma and the cars were lined up outside and ready to go, a variety of three-doors, five-doors and estates, with a variety of engines, too much choice for the few hours we had on the island. There were a few of the new 1.5 TSI EVO that produces 150ps but due to the huge demand from journalists to drive this new economical engine, we did not get chance to drive it, shame but these things happen. The first we drove was the ever popular and sweet 2.0 TDI 150ps and what a great engine this is, so quiet and refined. The diesel engine is the backbone of the Golf range and is the choice of most Golf buyers, although the 1.6TDI seems to be getting more popular and is now probably selling more than the 2.0. This Golf is referred to by Volkswagen as the 'updated' model or a minor facelift, as the exterior only gets a few changes: new bumpers, new radiator grille and new full-LED tail lights as standard and brand new LED headlights replace all xenon headlights on hatch and estates in model year 2017. 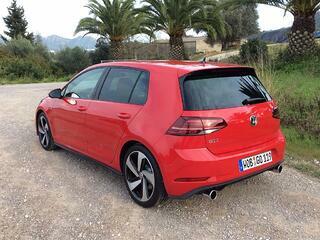 It is the new technology and new standard features that make this updated Golf look and feel new. The advancements from the previous model to this are very significant and customers who buy it are treated to some very nice new features including a high-end infotainment system with the largest display in its class. It also gets the new DIscover Navigation Pro infotainment system with gesture control, a clever bit of technology that shows the controls when you put your hand or fingers near it, making it easy to use and leaves the screen large and clear when you don't need to alter or change anything, but when you need to, the buttons pop up magically on the screen at the bottom of the screen. We then swopped into the lovely GTD 2.0 TDI 184ps and if we thought the 150ps was sweet, then this is super-sweet a diesel that drives and looks like a hot-hatch but has the economy of an economical diesel. This car will pull away easily in fourth gear and just keep going and going, such a great drive. Majorca remains a popular destination for holidays and is probably getting even more popular. But the areas and places we drove through are well off the tourist map and once you get outside the resorts and up into the hills then you see a completely different side to the island, it is stunning with some fantastic roads and scenery. This updated Golf MK7 or more accurately the MK7.5 also gets some additional safety equipment, though not standard on all models, such as Traffic Jam Assist, which is based the Lane departure warning system and ACC (Adaptive Cruise Control) is available on cars with a DSG auto gearbox. This very clever system braking and acceleration is taken over by the cars computers and radars. You simply set a maximum speed, then a distance between you and the car in front and then sit back. The car will 'lock-on' to the car in front and speed up and slow down as that car does, leaving a safe distance between the cars. If the car in front stops, so do you and when it starts moving again, so do you but there are sensors in the car to detect if the driver is not in control and will rouse the driver in escalating stages and if the driver remains inactive the hazard warning flashers are activated automatically and the Golf executes a gentle slow down and comes to a halt. Then we got into a superb GTI that produces 230ps or if you chose the GTI Performance then you get 245ps. But the 230ps has more than enough power, it is a very special car to drive. Despite its power and brilliant road holding it is very comfortable and doesn't ride like a hot-hatch, yes it's quick off the mark but you don't feel ill in it or as a passenger you can't wait to get out. The GTI feels rock solid and you feel as safe in this hatch as you do in a large executive saloon, it is the sort of car you could drive for mile after mile. As we were driving it, we said if the airport was shut and we couldn't fly back to the U.K. then we would happily take the ferry to Barcelona and drive home, it really is that good, once you’re sat in it, you don't want to get out. Prices for the entry level car, the Golf S 1.0 TSI 85ps 3 Door , remains the same at £17,625 OTR. Golf MK7.5 prices are reduced by an average of £650 across the range. Later in the year the e-Golf (pure-electric) will be launched, but will have 50% more range than the current model. Volkswagen confirmed that there will be ten new models (or facelifts) in 2017, and by 2020 all current models will have been replaced. The Volkswagen Golf has always been good but this new updated model is more refined, has more standard equipment which means it just got a whole lot better... just wonder how much better the MK8 will be when it arrives sometime in the future.